Recent meets are important opportunities for swimmers and divers to get into peak condition for Ivy League season. Earlier this week, both the men’s and women’s swimming teams traveled out to Austin, Texas for the Hall of Fame Invitational and the diving teams to Athens, Ga., for the Georgia Fall Invitational. Beginning on Wednesday night, the men’s swim team fielded a team of sophomore Levente Bathory, freshman Andrew Acosta, junior Raphael Marcoux, and junior Zach Snyder in the 800-yard freestyle relay. Placing 11th with a time of 6:40.89, Harvard competed in the event for the first time this season. Thursday opened up with with final qualifying times in the 500-yard freestyle posted by senior Brennan Novak, Snyder, and senior Gavin Springer. With times of 4:19.11, 4:26.36, and 4:29.23, respectively, all three swimmers notched season-best times. In the 200-yard individual medley, Harvard had junior Daniel Chang and senior Daniel Tran both qualify for the finals. In the championships rounds, Chang defeated the surrounding competition in the C-final with a season-best time of 1:46.66, thus qualifying for the NCAA B Standard. Tran finished the D-Final in 1:49.43 which gave him a third place finish among the eight racers. Closing Thursday’s opening session, junior Dean Farris notched the third fastest time in the preliminary rounds of the 50 freestyle at 19.49. This was the first time this season that a Harvard swimmer broke 20 seconds in the event. The night ended with a series of relays, with the quartet of Farris, Marcoux, Goddard, and sophomore Mahlon Reihman coming in at fifth with a time of 1:19.80 in the 200 freestyle relay. Shortly after was the 400 medley relay in which Farris, Chang, Marcoux, and Reihman finished seventh with a time of 3:10.38. On Friday, Farris qualified for two NCAA B Standards in the 200 free with a season best time of 1:33.53 and a first place finish in the 100 back with a time of 45.26. Now, the Atlanta native holds the top three times in the 100 back in program history. Daniel Chang followed in Farris’ footsteps with an additional B Standard qualification in the 400 yard individual medley, posting a time of 3:51.56. The men’s team meet ended with both Novak and Snyder putting up NCAA B Standard qualifying times of 15:02.72 and 15:23.99, respectively, in the 1,650 yard freestyle on Saturday. In Athens, Georgia, the men’s dive team had sophomore Alec DeCaprio earning a season-best and NCAA Qualifying Standard 307.10 points to come in sixth place in the 1-meter board. Sophomore Hal Watts followed in eighth with 271.30 points. The next day, Watts was Harvard’s top performer, finishing seventh in the 3-meter board with 301.85 points. For the women’s swim team, the Harvard quartet of senior Sonia Wang, freshman Samantha Shelton, freshman Helena Moreno, and junior Miki Dahlke finished in seventh place with a time of 7:09.84 in the 800-yard freestyle relay. Foursomes of senior Meagan Popp, freshman Mikki Thompson, sophomore Michelle Owens, and senior Claire Pinson and senior Brittany Usinger, junior Matti Harrison, freshman Liz Boyer, and senior Valerie Yoshimura finished the night with times of 7:20.11 and 7:23.97, respectively. On Thursday, Dahlke came in second place of the B-final of the 500-yard freestyle with a NCAA Qualifying B Standard time of 4:45.45. Meanwhile, Wang recorded Harvard’s top time in the 200 individual medley with a B standard time and third place finish of 1:59.19. The night ended with the quartet of Dahlke, junior Mei Lynn Colby, Shelton, and sophomore Ingrid Wall producing a season best time of 1:32.36 in the 200 free relay and the quartet of Harrison, sophomore Jaycee Yegher, sophomore Cassandra Pasadyn, and Pinson posting a 3:49.17 finish in the 400 medley relay. On Friday, Dahlke posted Harvard’s fastest time of the year in the 100 yard butterfly with a B Standard time of 53.64. Shelton duplicated this in the 200 freestyle with a 1:46.45. In the finals later that night, Shelton posted the eighth fastest time in the event and Dahlke came in fourth in the B-final. On the final day, Shelton, the Texas native, posted Harvard’s first sub two minute in the 200 yard backstroke with a time of 1:54.98. Both Yagher and Popp placed in the A final of the 200 breaststroke with times of 2:13.85 and 2:16.19, respectively. Two other swimmers posted B Standard times on Saturday, with Dahlke finishing the 100 freestyle in 49.01 and Usinger posting a 1:58.04 in the 200 butterfly. In Athens, senior Mikaela Thompson finished in third place in a season best effort of 290.50 in the 3-meter diving event. Harvard had two other divers place in the top 10, with freshman Esther Lawrence placing fifth with 264.80 and sophomore Georgina Milne in ninth with 249.75. In the 1-meter dive, Lawrence came in fifth place with 270.95, Thompson in eighth with 24.80, and Milne in ninth with 268.00. 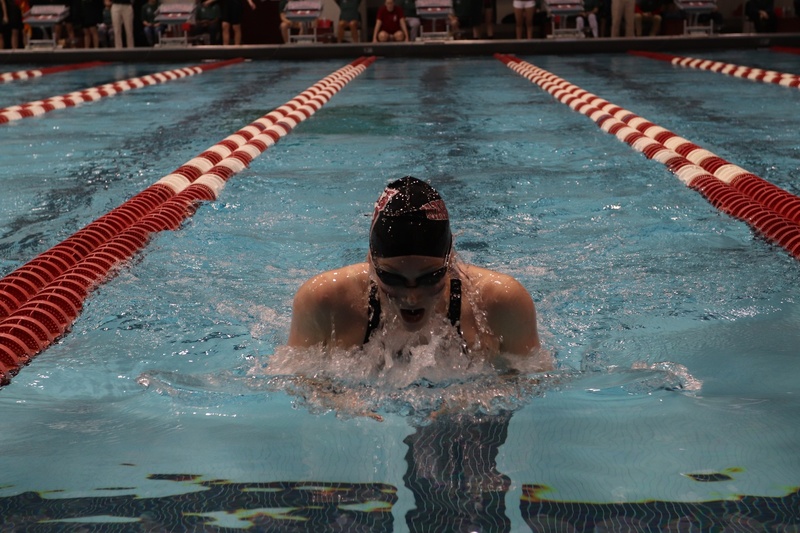 This weekend, the Crimson sent a handful of athletes to the NCAA Championships at the McAuley Aquatic Center in Atlanta, Ga. to face the nation’s fastest swimmers. No. 21 Harvard easily dispatched Boston College, 179-112, at Blodgett Pool on Saturday to keep its undefeated streak alive, snapping the Eagles’ (10-3) run of eight consecutive wins. The Harvard women’s swimming and diving team finished second overall in the 2017 Ancient Eight title-deciding meet, capping a weekend in which the Crimson women broke a couple of records and won several individual titles.